Tired of boring tees? Change up your shirts by simple color blocking or this draped version. The latest trend in sweatshirts and active wear is to have them with a cozy, cowl style neck. Learn how to make one for yourself with this free pattern. Infinity scarves are still a hot accessory this fall\winter. Learn how to sew up a quick single loop version and have it ready by tomorrow! Messenger style bags are one of my favorites to sew and carry. The Malibu Satchel is a great style that can showcase your fun fabrics. Speaking of bags, enter to win an entire Serendipity Studio purse prize pack. Don’t throw out those old jackets – upcycle them into pretty skirts instead! There’s still plenty of days left before Halloween. Why not sew up a matching (or fun print) Trick-or-Treat bag? Have a bit more time on your hands to sew? This version has compartments for kids who like to hide sort their candy ahead of time. Two different colors of faux leather are used to make this pretty (and easy to sew) fold-over clutch. If you love aprons, you won’t want to miss this giveaway of the Flirty Dozen Apron pattern. Make gloomy a little more fun when you stitch up a raindrop plush. A pencil case that not only carries more than pencils, it rolls up too (plus it has a fun patchwork technique too)! Need something a bit bigger? Try this busy bag tutorial instead! It may be (finally) chilly here, but I’m not sure that will stop me from sewing this pretty, loose top (which really looks more like a tank. Site will need to be translated). This entry was posted in Uncategorized on October 29, 2015 by stacy. 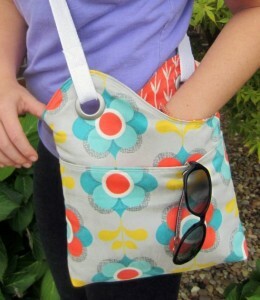 Be sure to head over to Betz White’s blog this morning and check out my latest project – the Sidekick Sling! What sets this project apart from others that I’ve worked on? It uses Spoonflower’s print on demand service, Sprout! This is a ‘cut & sew’ style project that takes out the need for paper patterns and measuring (in fact, this particular project didn’t even use interfacing)! This bag was quick and easy to sew with fantastic results – you can read all about how to select your fabrics and create your own Sidekick Sling here. This entry was posted in Uncategorized on October 28, 2015 by stacy. 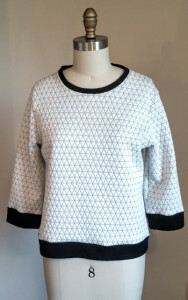 As much as I love beautiful dresses and classy ‘business wear’, my lifestyle is pretty casual so I’m always on the lookout for patterns that I can either sew several times or at least make a garment that I’ll wear a lot. 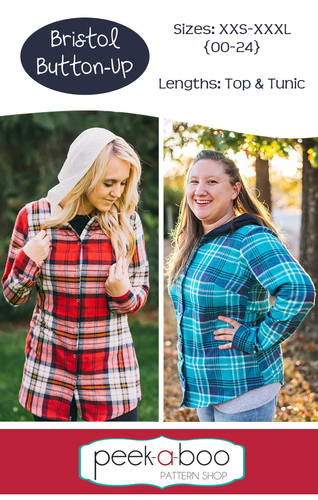 Last week, Peek-a-boo Pattern shop released the Bristol Button-Up and I immediately snagged it – I can totally see wearing this look with a pair of skinny jeans and some fantastic boots (note to self, I need new boots now). I’ve printed off the pattern (but have yet to put it together, that’s today’s job) and pulled fabric from my stash…. yes, I actually have everything on hand to whip this one up (full disclosure, I had purchased flannel last year because I thought I was going to make Easton a Lumberjack Shirt and that just never happened). I’m leaning toward the tunic length and am crossing my fingers that I have enough material to pull it off! I am also contemplating using snaps instead of buttons since I have quite a few from the Adelaide project that just didn’t work out. This entry was posted in Uncategorized on October 27, 2015 by stacy. I got off easy this year. This year, I didn’t have to make any Halloween costumes. Sort of. 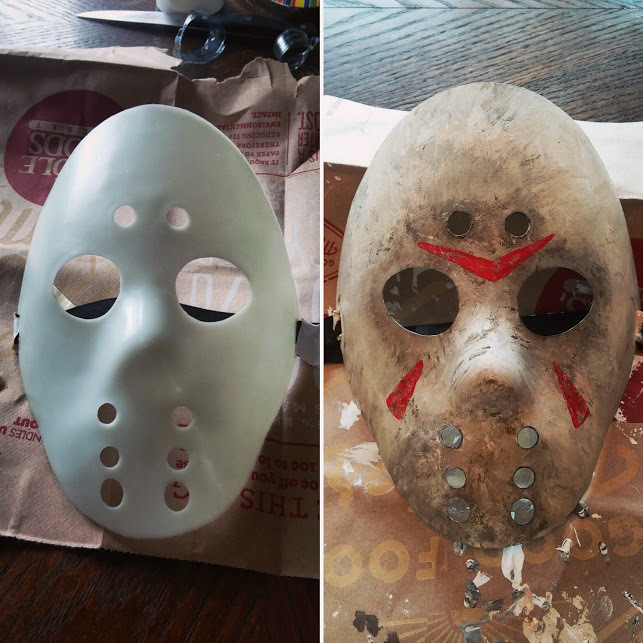 The photo on the left is the original, glow-in-the-dark mask and the photo on the right is after I painted it up. It took a bit of trial and error to get the right look, but in the end, the best technique was lots of paint mixing and dabbing with paper towels (forget the brushes and sponges, they just streak and smear on the plastic). I guess I can put “movie replica costumer: to my resume now. This entry was posted in Uncategorized on October 26, 2015 by stacy. My favorite type of sewing book is filled with lots of projects. However, most are very “set” in the specific styles and patterns that they offer. So, basically, it’s up to you to modify the designs and make them your own. Victory Patterns designer, Kristiann Boos, takes a completely different approach in her new book, Boundless Style by giving you the building blocks to design your own garment without having to make those modifications! Inside Boundless Style are 5 different bodices, sleeves, and skirt styles in a variety of shapes and styles that allow you to design you own silhouette. Not only can you create peplum tops and skirt separates, but Boundless Style also helps you to design an entire dress to suit your needs – there hundreds of different combinations to try! This entry was posted in Uncategorized on October 23, 2015 by stacy. Summer BBQs may be coming to an end, but that doesn’t mean you can’t show your love of the grill when you carry around this ADORABLE burger pouch. 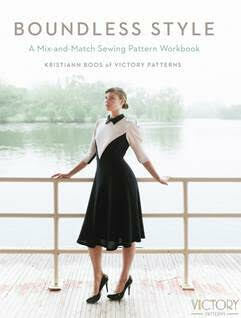 Win a copy of the sewing book, Just for You! The conversation bag isn’t just a good way to use up scraps, it’s definitely a statement purse as well! Love camping? Show your 3rd-wheel pride with this vintage camper kitchen set. This mini blanket is perfect for snuggling on the go. Need something a bit larger? This blanket can be whipped up in about 30 minutes. Make bedtime more fun with a Sleepy Time Stuffed Owl. Winter weather calls for warm layers. Keep your child cozy after you stitch them up a Goodall Cardigan. Looking for something for women? Try this Hacci Knit Kimono Cardi. Learn how to make a quick drawstring bag – perfect for trick-or-treating or just for carrying around your goodies. Looking for a cute way to keep your doors from swinging shut? Try Dave Dachshund Doorstop! It’s not too late to sew up decorations for Halloween! This Black Cat Brigade Banner looks to be a quick and easy way to bring some not-so-scary decor to your home. If you didn’t see my post earlier in the week, my Merry Tiding’s Tote made the cover of Creative Machine Embroidery this month! You can get the entire project instructions here. Get a head start on Christmas sewing, by making a few of these DIY Heating Pads – perfect for stocking stuffers! This entry was posted in Uncategorized on October 22, 2015 by stacy. 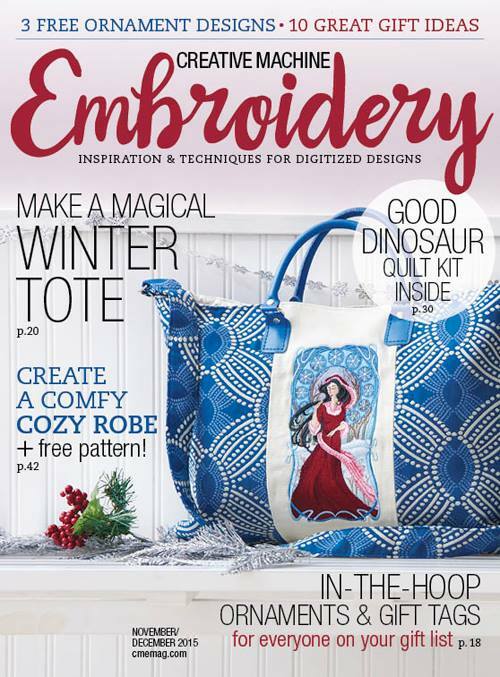 The latest issue of Creative Machine Embroidery has hit the stands (November\December 2015) and my Merry Tidings Tote is on the cover! When I got the project sheet for this article, I knew exactly what I wanted to do – a bag with all the “bells and whistles” (pockets, zipper, handles), but with an easy enough construction that an advanced beginner could put it together… and I hope that’s what I accomplished. This tote features front embroidery design (you could easily skip this if you don’t have an embroidery machine, insert a favorite panel\fabric, or create the front just like the back instructions), a front and back pocket for storage, a recessed zipper, and both (purchased) handles and a strap for carrying. The finished size is 14″ x 18″ – so there’s plenty of room for everything you need to haul around this holiday season! You can download the full article (for free) here. You can find the front panel design a Embroidery Library (I will not lie, it is large – over 4 hours of stitching time and 33 thread changes, but well worth it because it is stunning) and the fabric in the home decor section (on the rolls) at Joann’s. Have fun and be sure to share your Winter Tote creations with me! This entry was posted in Uncategorized on October 20, 2015 by stacy. Even though I have a mountain of work, I couldn’t resist spending a few hours with Sewaholic’s Fraser pattern to make my own quilted version (view B). Of all the views, this one is the easiest to put together since it has no inserts. Consequently, I was able to put this one together in just under an hour (sewing time only). The fit is very similar to my previous version, however, the material on this Fraser gives it an entirely different look – it’s definitely boxier (due to the thicker fabric) and I somehow feel like a very casual Jackie O while wearing it. I know that Sewaholic paired this particular top up with leggings for their model shoot (I’m sure because that pattern was released at the same time), but I’m here to tell you that they do not look particularly good together. I highly recommend jeans or pants for styling this one. This entry was posted in Uncategorized on October 19, 2015 by stacy. Even though my to-do list is a mile long, I have decided that I’m devoting a few hours today to make the 3/4 sleeve version of Sewaholic’s Fraser. I was very careful when I cut out my Dropje Vest so that I would hopefully have enough material left over to make this exact shirt (it may have black instead of gray ribbing, though)…. and from a quick layout I think that I do (if I once again cut out my material very carefully)! The construction on this looks pretty simple, so hopefully by the end of the day I’ll have a new top! This entry was posted in Uncategorized on October 16, 2015 by stacy. Have a hard time getting your little one to wear hats or hoods when the weather turns cold? Add ears! Don’t have a hood to add ears to? This tutorial will teach you how to make one (with ears, pattern included)! Chill in the air? Then you’ll want to warm up with an oversized faux fur coat. The Brief Encounter Dress was originally designed with summer in mind, but would definitely look adorable with a cardigan over top. My oldest loves her body pillow so much hat it is now screaming for a new cover. This one not only has a zipper so it can be easily washed, but it also has a pocket large enough to store a tablet or book. A mermaid costume that you can not only walk around up, but allows you to slip your feet inside for a ‘realistic’ tail look. If you prefer to decorate for fall instead of Halloween, be sure to check out this tutorial for a cute pumpkin table runner. Looking for one that can be put out year-round? Try this one designed by Pat Bravo. This phone wallet not only keeps your iPhone protected, but carries your cards as well. (Beware this is sized for the iPhone4 – you’ll need to change the dimensions for Android or newer iPhones). There’s no sewing involved, but these Halloween pompoms are too fun not to share (they eyeballs are my favorite). These clear bags are great for stashing sewing supplies while allowing you easily see what is inside! A pretty way to keep your cords tidy. Looking for a quick gift or just need a cute little clutch? This tutorial will help you make one. If you’re like me, you never know what to do with those precut fabric squares. This tutorial shows you how to turn them into patchwork floor pillows (with a really interesting shape). This entry was posted in Linky Thursday on October 15, 2015 by stacy.